New $0.50/1 McCormick Skillet Sauce Coupon – Only $0.96 at Walmart & More! There is a new McCormick Skillet Sauce Coupon available to print. 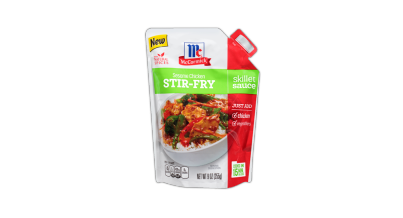 The coupon is for $0.50 off (1) McCormick Skillet Sauce. The coupon says “Redeemable at Walmart” however it is a regular manufacturer’s coupon and can be used anywhere. Walmart sells the McCormick Skillet Sauces for $1.46 making them $0.96 after the coupon. Lowes Food sells the McCormick Skillet Sauces for $1.99 making them $0.99 after the coupon. Note, this is a new product so we should see some great sales on it soon! Afrin Nasal Spray – 65% off at Walmart! sl on Unadvertised ShopRite Gift Card Deal – Get $10 in FREE Groceries!